Our deep space renderer accurately shows distant galaxies in their correct 3D position, relative size, brightness, dominant colour and shape, based on astronomical catalogues and a library of telescope images. This enables us to fly between galaxies and show an overview of the large-scale structure of the Universe, including galaxy groups, supergroups, chains and walls. By using consistantly-scaled geometry, and compositing with the output of our other renderers, our Deep Space renderer allows us to produce continuous animation sequences taking you from rooftop level to the edge of the known Universe. 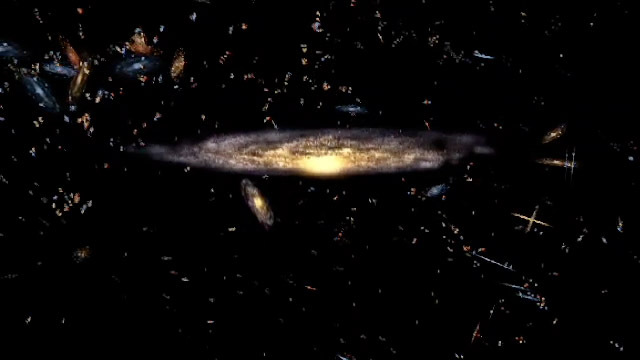 Cosmic zoom sequence from the documentary tv series 'Universe' for Pioneer Productions and Channel 4, all based on accurate 3D spatial data.